While sitting atop Sphinx Rock I’m thinking about generations. 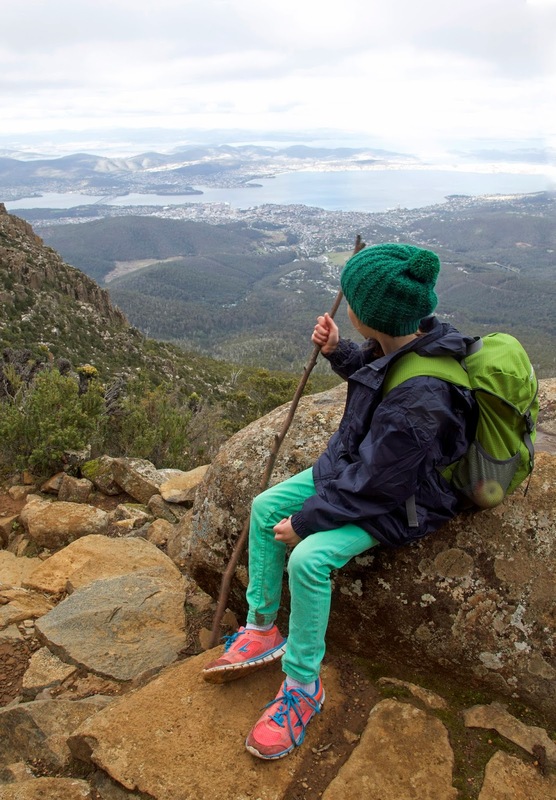 Our family has been visiting this lookout rock for more than thirty years, but how many generations of Hobartians have done the same before us? And how many generations of the Mouheneener Aboriginal band came to this perfect outlook and its “downstairs” shelters? More than a thousand? Our own three generations delight in the views and the lunch provided by Lynne. But my mission to get to the top in good time keeps popping into my mind, as well as the question of who‘s going to join me for the final stage. As I bite into my apple, I learn that it’s all sorted. Our eldest granddaughter, 9 year old Emily, is set to accompany me to the top. The two of us set off, Emily bounding ahead, bursting to climb her first mountain. At a similar age I thought to do the same, also after a family picnic. 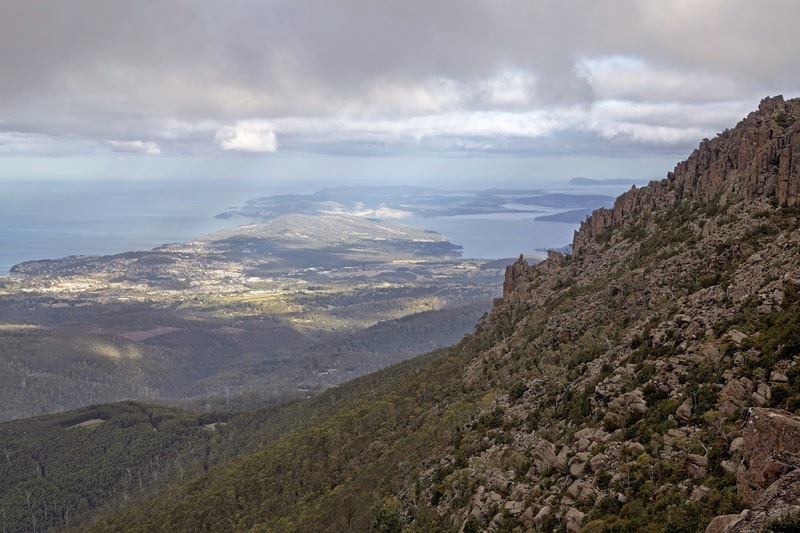 I had crossed the Hawkesbury River, west of Sydney, clambered up the far bank, and begun climbing the Blue Mountains. Or so I thought, until I was dragged back after a sister informed on me. For Emily it is actually happening. We follow the Sawmill Track steeply up through rocky scree, cross the Pinnacle Road, then angle back towards the aptly named Organ Pipes. Emily asks if the dolerite pillars are the actual top. 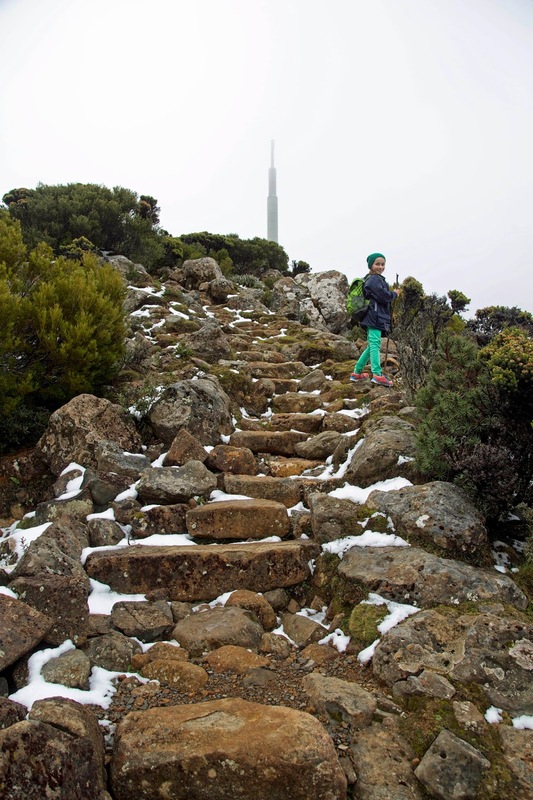 I tell her we have to take the Zig Zag Track around the Organ Pipes before we get to the summit. She just smiles and skips ahead to find herself a walking stick. My thoughts turn to gloomier matters: namely plans for a cable car that would slice through the sky above here. I am revolted by the idea; by the thought that this mountain, this sky, this view, could be visually “mined” by a company for their profit. And for the convenience and momentary thrill of some. I have travelled on cable cars in the European Alps. History, geography, snow and a huge population warrant their use there. None of those factors pertains here. Tasmania is not Europe, and can’t try to be. Our strength is wildness, not amusement rides. But besides the aesthetic and environmental objections, I also doubt that an economic case could be made for this venture. I fear seeing State government money – our money – being endlessly siphoned off to rescue a failed venture. Tasmanian history is littered with such stories. Emily and I walk on beneath what could become invaded space, violated silence. We are making statements with our feet. It’s the very day thousands are doing the same in support of the threatened World Heritage forests of the Florentine. We do what we can, and we hope. 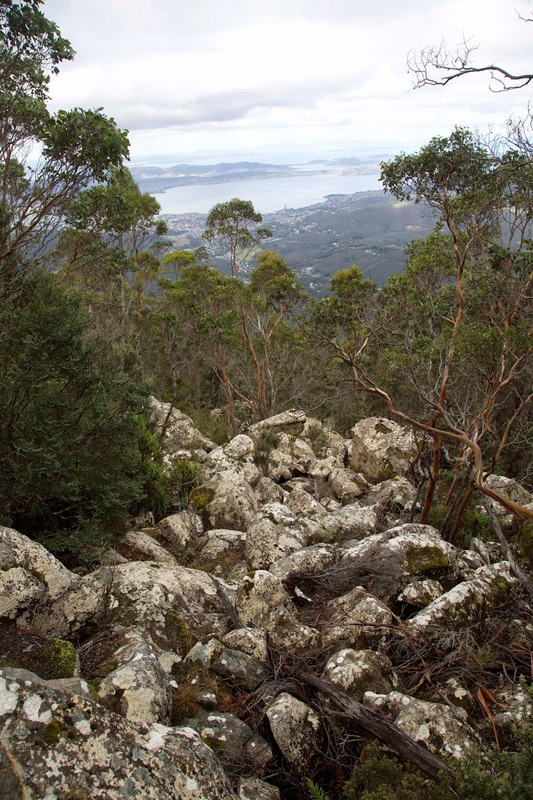 At around 900m the Sawmill Track hits the Organ Pipes Track, and we jag left. I’ve been telling Emily about the tree line, and she notices that the trees are starting to get shorter. 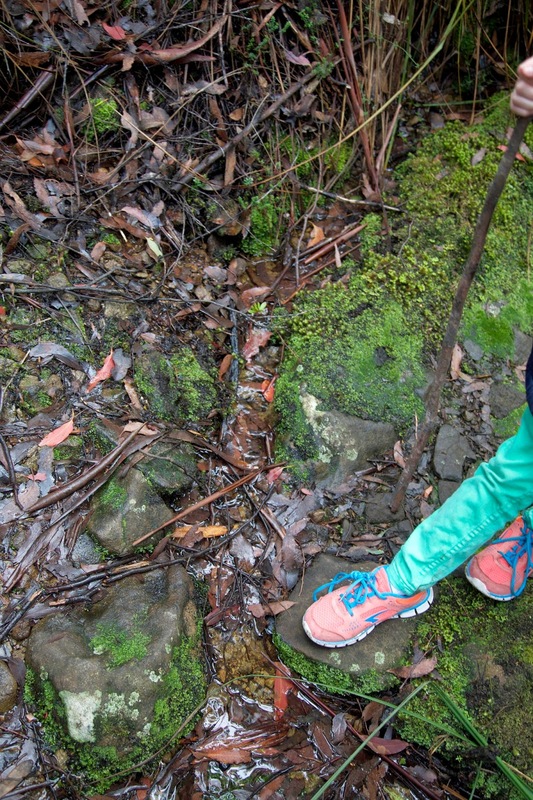 She’s also curious about the source of the Hobart Rivulet. As we turn onto the Zig Zag Track, each fresh flow of water prompts her to wonder whether the Rivulet might start here. We catch up with a group of adults who are also heading for the summit. They are very impressed with Emily’s efforts. She smiles shyly, but I think she’s pleased. If she needed any extra encouragement, the timing is good. The track is now into its steepest section, drawing adjacent to the southern flanks of the Organ Pipes. “That’s why it has to zig zag” I tell her. More interesting to her are the small patches of snow we start to find. Briefly Emily forgets all about the mountain. She whips off her gloves, plunges her hands into the snow, flings snow balls around, even fashions a miniature snow man. Eventually, and for the first time on the walk, I have to urge her to keep moving. Clouds are threatening to obscure our summit views. Then we turn a corner and the track becomes a long, broad hump stretching towards the highest point. 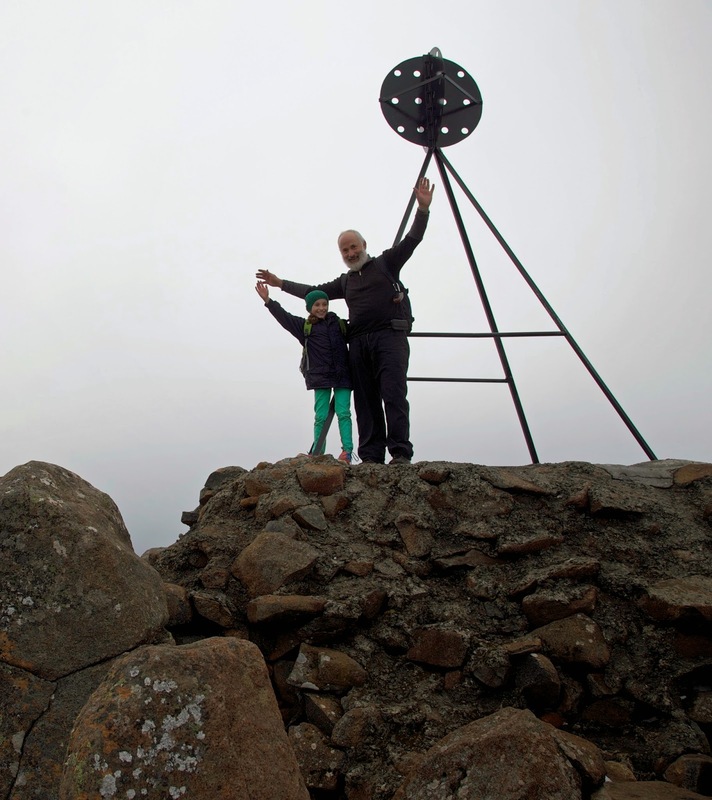 In concentrating on how Emily was faring I’ve almost forgotten that this my destination: the 1271m summit of kunanyi/Mt Wellington. All that remains is to climb the humble pile of boulders that surrounds the high point and its trig station, and join hands in triumph. A German tourist kindly captures the moment for us on my camera. Then it’s back to the car, which has been left for us in the nearby car park. If I’m inclined to think this a little anti-climactic, Emily snaps me out of it by putting the traditional pile of snow on the bonnet of the car. I remember afresh to be proud of my young apprentice, and give her a congratulatory hug. May we share many more summits!